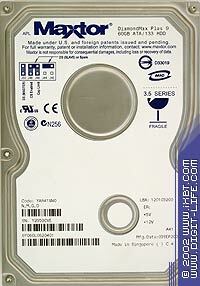 Almost every manufacturer has already released an IDE hard drive of the new generation. The reviews are maybe a bit late, but better late than never :). So, we are starting a series of reviews of new drives from Maxtor, Seagate and Western Digital which will be examined alphabetically. Three new lines of Maxtor arrive first. 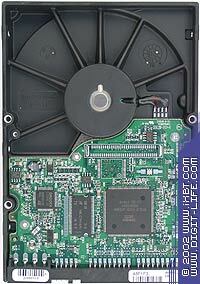 The full specification of the drives can be found in the table. The drives were tested in four modes - with factory settings (acoustic level = fast) and with acoustic management off with the drives connected to the ATA/133 controller or the internal ATA/100 controller. Like before, the difference between the fast and off modes affected only the access test results and Ziff-Davis WinMarks, while connection of the drives to the ATA/100 controller affected only the scores in the Ziff-Davis WinMarks inconsiderably, the rest of the benchmarks were not affected (check it here). That is why the diagrams will be given only for the ATA/133 acoustic management off mode. 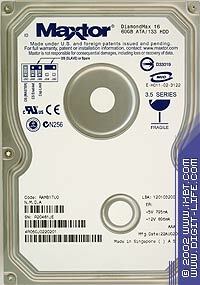 The competitors are the fastest drives of the last generation - IBM IC35L120AVVA07-0 (DeskStar 120GXP) and Western Digital WD 1200JB with an 8MB buffer, Western Digital WD600AB and Maxtor D540X for the drives of 5400 rpm spindle speed. I will use the line's name instead of the codename if there is no ambiguity. The DiamondMax Plus8 is unexpectedly ahead. 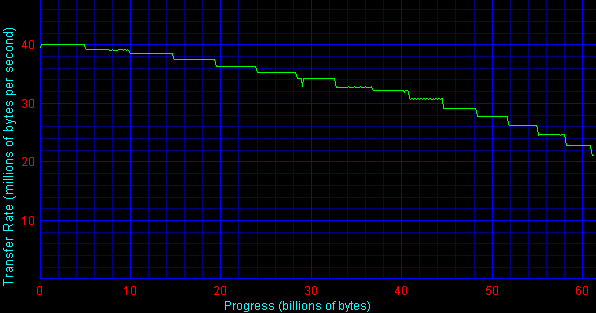 This is the first drive that cleared the bar of 50 millions bytes/sec. 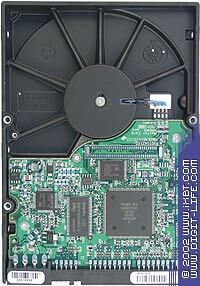 The DiamondMax Plus9 is not far from the WD1200JB of 40GB per platter. However, it could be hardly expected that the twice higher recording density would make the linear read speed go up twice as well because the density grows mostly at the expense of shorter distances between the tracks rather than at the expense of a greater number of sectors on a track. Well, quality of the platters of the Maxtor's models is very high. 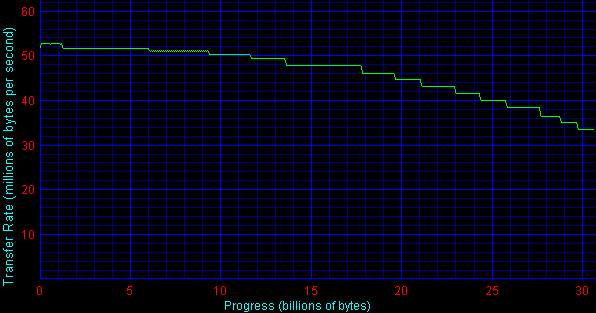 The actual linear read speed in the beginning of the DiamondMax Plus9 is around 50 millions bytes/sec, the low scores are caused by the drop on the diagram. The DiamondMax Plus8 is leading taking into account an average read speed and write speed. It's a bit strange to see the DiamondMax Plus9 in the middle of the list. Well, here the IBM's solutions are second to none. The newcomers have shown quite expected scores close to the specified ones - the DiamondMax Plus8 has <14.17 ms in its specs and the DiamondMax Plus9 has <13.17 ms. The difference between the specs and test results is less than 1 ms. This is not the best test for the new Maxtor's solutions. Their scores are worse than those of the rivals. But I think that the benchmark of the last century doesn't reflect operation of modern applications good enough, at least judging by sizes of files processed. 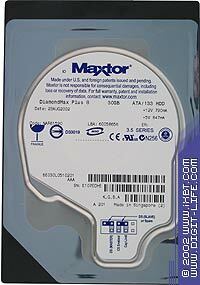 The new Maxtor's drive is in the middle. The growth of the recording density didn't boost the linear read speed much. Again, we can see that the platter are of really superb quality. The same second position. However, the write speed is much higher compared to the predecessor - Maxtor D540X. Although the specified access time is <17.56 ms, the test gives almost 30 ms! Note that it's not a preproduction sample at all. I hope this is a problem of just this particular drive. I will try to get another one to find it out. I expected it would be worse. But the terrible access time affected only operation with the NTFS file system. In case of the FAT32 the drive takes a position according to the test results of the linear read speed. The newcomers do not shine at all. All the access models show identical behavior. It's quite surprising that at higher loads the DiamondMax Plus8 takes the lead though it's not necessary in its market sector. In case of the linear load the drives must take positions according to their access time. Well, this is exactly what we can see. As the load grows up the Maxtor's models fall behind the competitors, with the DiamondMax Plus8 going ahead earlier than in the previous models. I doesn't seem logical. Here it's the access time that tells upon the scores. We didn't test the Maxtor D540X here. The results are quite expected - a big access time doesn't let the DiamondMax 16 show a decent speed. Well, the increase of the recording density of the Maxtor's drives up to 80GB per platter makes the maximum capacity greater and storage of an information unit cheaper. However, you shouldn't expect a significant performance gain. 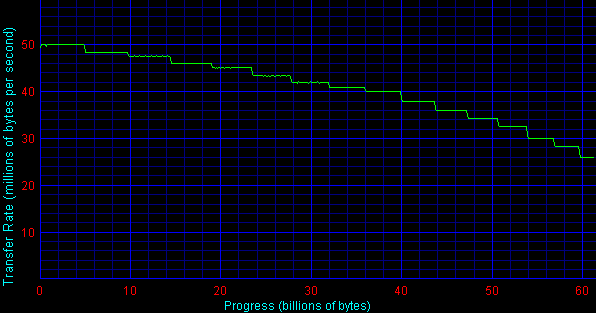 Moreover, in some tests the drives score lower results compared to the drives of the lower recording density.